The 2.4x GHz range of 2.401 – 2.473 GHz is separated into 11, 22-MHz channels. Note that 2.473GHz – 2.401GHz = 72 MHz, yet 11 times 22 MHz is 242 MHz. So, how does 242 MHz fit into 72 MHz? The answer – the channels overlap. In fact, 17 MHz of each 22 MHz channel (over 77%) overlaps with adjacent channels. As a result -- not only is it not obvious which is the best channel but, with few exceptions, the best configurations will only use channels 1, 6, or 11. When two Wi-Fi devices are configured to use the same channel then they can "arbitrate" use of the channel and share the bandwidth -- that is, efficiently take turns. As long as the total traffic is less than the channel's bandwidth ceiling, then performance is good. However, if a Wi-Fi device were to use a channel other than 1, 6, or 11 then it can not "arbitrate" with other devices and share that channel's bandwidth. Hence, that "non-conformist" device will be perceived as interference by APs operating on channels 1, 6, 11, and APs on channels 1, 6, 11 will be perceived as interference by the "non-conformist" AP. As a result, everyone's performance will suffer. The next time you are at a major airport use a Wi-Fi scanner app (e.g. WifiExplorer) to see all the available APs. There will probably be more than a dozen and only channels 1, 6, 11 will be used. At an airport the wireless is configured by professional -- and they understand why it is important to stick with channels 1, 6, 11. 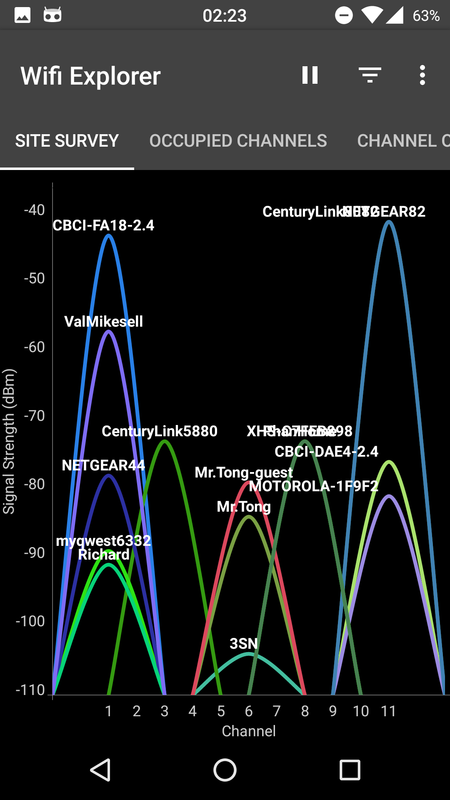 The image above shows a Wi-Fi scan of the 2.4x GHz band. All the APs, with the exception of two, have been configured to use either channel 1, 6, 11. There is one AP using channel 3 and another using channel 8. When those two APs transmit data packets they will cause interference on adjacent channels -- and, vice-versa. Our advice -- don't be that person who decides to use channel 3 or 8 because there are no other APs on those channels.